Carolyn Baylies, 56, American academic and activist, cancer. Michael DeSisto, 64, American educator, cerebral hemorrhage. W. Brian Harland, 86, British geologist. Colin Hayes, 83, British artist. Daishiro Yoshimura, 56, Japanese football player and manager, intracranial hemorrhage. Carolyn Louise Baylies, was an American academic and activist. She was particularly active in the fields of health and sociology of the third world and international development, and especially on the gendered aspects of development. Baylies was particularly notable for her work on the ways in which the AIDS epidemic threatened existing social structures and food security, a connection which she was one of the first to make. A. (Albert) Michael DeSisto was an American educator best known for founding and directing the DeSisto Schools. Walter Brian Harland was a British geologist at the Department of Geology, later University of Cambridge Department of Earth Sciences, England, from 1948 to 2003. He was a leading figure in geological exploration and research in Svalbard, organising over 40 Cambridge Spitsbergen Expeditions (CSE) and in 1975 founded the Cambridge Arctic Shelf Programme (CASP) as a research institute to continue this work. He was first secretary of the International Geological Correlation Programme from 1969 until UNESCO could take over in 1972, and was a driving force in setting criteria and standards in stratigraphy and producing 4 editions of the geological time scale in 1964, 1971, 1982 and 1989. He also edited the international Geological Magazine for 30 years. In 1968, he was honoured with the Royal Geographical Society Gold Medal for Arctic exploration and research. Bukari Adama, 77, Ghanaian politician and minister of state. Christabel Bielenberg, 94, British writer. William F. Borgmann, 90, American football player and coach. Nati Kaji, 77, Nepali singer and songwriter. Iris Kelso, 76, Mississippi-born journalist best. Mariya Shkarletova, 78, Russian field medic during World War II. Frances M. Vega, 20, United States Army soldier, killed in action. Frederic Vester, 77, German cybernetician. Cliff Young, 81, Australian athlete, cancer. Bukari Kpegla Adama was a Ghanaian politician and a minister of state in the Second Republic. Christabel Bielenberg was a British writer who was married to a German lawyer, Peter Bielenberg. She described her experiences living in Germany during the Second World War in two books: The Past is Myself (1968) and The Road Ahead. She was educated at St Margaret's School, Bushey, Hertfordshire. William F. "Bill" Borgmann was an American football player and coach and businessman. He was a lineman for the undefeated national champion 1932 and 1933 Michigan Wolverines football teams and a line-mate of future President Gerald Ford on the 1934 team. He was also an assistant football coach on Michigan's 1935 team. Aaron Bridgers, 85, French jazz pianist. Rasul Gamzatov, 80, Avarian/Soviet/Russian poet, called the "People's poet of Dagestan". A. James Manchin, 76, American politician, Secretary of State and State Treasurer for West Virginia. Aaron Bridgers was an African-American jazz pianist who moved to Paris, in 1947. Bridgers was jazz composer Billy Strayhorn's lover from 1939 until Bridgers' move to France. Rasul Gamzatovich Gamzatov was a popular Avar poet. Among his poems was Zhuravli, which became a well-known Soviet song. R. M. Williams, 95, Australian bushman and entrepreneur. Charles Causley, 86, British poet. Ken Gampu, 74, South African actor. Richard Wollheim, 80, British philosopher. Reginald Murray Williams AO, CMG was an Australian bushman and entrepreneur who rose from a swagman to a millionaire. Widely known as just 'R.M. ', he was born at Belalie North near Jamestown in the Mid North of South Australia, 200 kilometres north of Adelaide, into a pioneering settler family working and training horses. R.M. had many adventures in Australia's rugged outback as a bushman, and became known for creating an Australian style of bushwear recognised worldwide. Charles Stanley Causley, CBE, FRSL was a Cornish poet, schoolmaster and writer. His work is noted for its simplicity and directness and for its associations with folklore, especially when linked to his native Cornwall. Ken Gampu was a South African actor. Dorothy Fay, 88, American actress. Bobby Hatfield, 63, half of the singing duo the Righteous Brothers. Zaim Muzaferija, 80, Bosnian actor and poet. Dorothy Fay was an American actress mainly known for her appearances in Western movies, including several with her husband-to-be Tex Ritter. She was the mother of John Ritter and paternal grandmother of Jason Ritter and Tyler Ritter. Robert Lee Hatfield was an American singer, best known as one half of the Righteous Brothers. He sang the tenor part for the duo, but his most recognizable work is his 1965 recording of "Unchained Melody" which he performed as a solo. The Righteous Brothers were originally an American musical duo of Bill Medley and Bobby Hatfield. They began performing together in 1962 in the Los Angeles area as part of a five-member group called the Paramours, but adopted the name "The Righteous Brothers" when they embarked on their recording career as a duo. 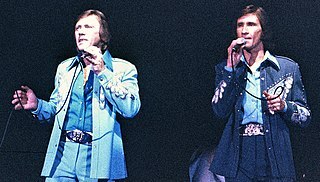 Their most active recording period was in the 1960s and 70s, and although the duo was inactive for some years, Hatfield and Medley reunited in 1981 and continued to perform until Hatfield's death in 2003. Their emotive vocal style is sometimes dubbed "blue-eyed soul". Eduardo Palomo, 41, Mexican actor, heart attack. Crash Holly, 32, American professional wrestler. Rie Mastenbroek, 84, Dutch swimmer, triple Olympic champion. Rudolf Schönbeck, 84, German football player. James L. Bentley, 76, American politician, Comptroller General of Georgia. Jack Durrance, 91, American rock climber and mountaineer. Donald Griffin, 88, American professor of zoology. C. Z. Guest, 83, American socialite. Malcolm Douglas-Pennant, 6th Baron Penrhyn, 95, British soldier and aristocrat. Michael Pollock, 82, American opera singer. T. A. Venkitasubramanian, 79, Indian biochemist. Buddy Arnold, 77, American jazz saxophonist. Art Carney, 85, American actor ( The Honeymooners , Harry and Tonto , The Late Show ). David Gray, 81, English cricketer. Mario Merz, 78, Italian artist. Gordon Onslow Ford, 90, British-born American surrealist painter. Canaan Banana, 67, first president of independent Zimbabwe. Irv Kupcinet, 91, American columnist, television personality. Morten Lange, 83, Danish mycologist and politician. Heinz von Allmen, 90, Swiss Alpine skier. Lloyd Pettit, 76, American sportscaster. Robert Brown, 82, British actor (M in 4 James Bond films). Miquel Martí i Pol, 74, Catalan poet. Shmuel Shtrikman, 73, Israeli physicist. Don Taylor, 67, British theatre and television director. Harold Walker, Baron Walker of Doncaster, 76, British politician. George Wallace, Baron Wallace of Coslany, 97, British politician. Tony Thompson, 48, drummer for The Power Station. Penny Singleton, 95, American actress. Jonathan Brandis, 27, actor ( seaQuest DSV , It , Sidekicks ), suicide by hanging. B. M. Gafoor, 61, Indian cartoonist and comic artist, heart attack. Ray Harris, 76, American rockability musician and songwriter. Nobuo Okishio, 76, Japanese Marxian economist. Kellie Waymire, 35, actress ( Star Trek: Enterprise , Six Feet Under ), cardiac arrest. Norm Baxter, 94, Australian politician. Pierre Camonin, 100, French organist and composer. Giles Gordon, 63, Scottish literary agent and write. Pete Rawlings, 66, American politician. Gene Anthony Ray, 41, American actor, dancer, and choreographer, complications of a stroke. Tim Vigors, 82, British fighter pilot. Ray Lewis, 93, first Canadian-born black Olympic medalist. Mohamed Choukri, 68, Moroccan author and novelist. John Stamper, 77, British aeronautical engineer. Laurence Tisch, 80, American billionaire, head of Loews Corporation and CBS television network. Dorothy Loudon, 70, American actress. Walt Conley, 74, American folk singer, Hollywood actor, voice actor, and owner of Denver’s folk venue Conley’s Nostalgia, stroke. Lucien Dahdah, 74, Lebanese academic, media executive and politician. Thomas B. Fitzpatrick, 83, American dermatologist. Arihiro Fukuda, 40, Japanese associate professor and author of Sovereignty and the Sword. Bettina Goislard, 29, French UNHCR relief worker, killed by Taliban militants. Catalino Macaraig Jr., 76, Philippino public servant. Gerry Adams, Sr, 77, Irish Republican Army volunteer, father of Gerry Adams. Arthur Conley, 58, American soul singer. Don Gibson, 75, American singer-songwriter. Anton Burg, 99, University of Southern California chemistry professor. Michael Kamen, 55, American composer ( Die Hard , Band of Brothers , 101 Dalmatians ). Christfried Berger, 65, German protestant theologian. Greg Ridley, 56, English rock artist, complications following pneumonia. Robert E. Thompson, 82, American political journalist. David Dacko, 73, first president of the Central African Republic. Robert Addie, 43, British actor. Eugene Kleiner, 80, entrepreneur and co-founder of Kleiner, Perkins, Caufield & Byers venture capital firm. Roger Short, 58, British diplomat, consul-general in Istanbul. Kerem Yilmazer, 58, Turkish actor. Jim Siedow, 83, American actor. Theo Berger, 62, German criminal. Ronald Moore, 89, Canadian politician. Teddy Randazzo, 68, American singer-songwriter. Edward R. Schowalter Jr., 75, U.S. Army officer. Yuri Khukhrov, 71, Russian Soviet realist painter and graphic artist. George Peoples, 43, American football player. Dru Sjodin, 22, American murder victim. Nick Carter, 79, New Zealand cyclist. Jack Fitzgerald, 73, Irish footballer. Peter Gallagher, 66, Australian rugby league player. Patrick Jansen, 82, Indian Olympic hockey player. W. Fred Turner, 81, American attorney. George Dunlap, 94, American golfer. Hugh Kenner, 80, Canadian literary critic. Michael Small, 64, American film score composer. Floquet de Neu, 38-40, Spanish only albino Western lowland gorilla in the world. Frank B. Colton, 80, American chemist. Zhang Honggen, 67, Chinese football player and coach. Lionel Ngakane, 75, South African filmmaker and actor. Gordon Reid, 64, Scottish actor. Soulja Slim, 26, American rapper. Stefan Wul, 81, French science fiction writer. Satyendra Dubey, 30, Indian Engineering Service officer, assassinated. R. D. Lawrence, 82, Canadian naturalist and wildlife author. Will Quadflieg, 89, German actor. Marjorie Reeves, 98, British historian and educationalist. Ted Bates, 85, British footballer and manager. Harold von Braunhut, 77, American creator of Amazing Sea-Monkeys. Mihkel Mathiesen, 85, Estonian politician. Tony Canadeo, 84, American football player (Green Bay Packers) and member of the Pro Football Hall of Fame. Jesse Carver, 92, English football player and manager. Len Lawson, Australian comic book creator and convicted murderer. Barber B. Conable, 81, New York Congressman, president of the World Bank from 1986–1991. Gertrude Ederle, 98, first woman to swim the English Channel (1926). Granville Slack, 97, British judge and politician. ↑ "Sonny Senerchia". Baseball-Reference.com . Retrieved 2019-02-22. ↑ "Frank McCloskey, 64, Former Congressman". The New York Times . Retrieved 3 February 2019. ↑ "Dernell Stenson". Baseball-Reference.com . Retrieved 2019-02-23. ↑ Johnson, Bill. "Spider Jorgensen". Society for American Baseball Research . Retrieved 2019-02-23. ↑ Herrman, Jack. "Earl Battey". Society for American Baseball Research . Retrieved 2019-02-23. ↑ "Pete Taylor". Baseball-Reference.com . Retrieved 2019-02-23. ↑ Arnold, Jonathan. "Ken Brett". Society for American Baseball Research . Retrieved 2019-02-23. ↑ "Joe Just". Baseball-Reference.com . Retrieved 2019-02-23. ↑ Kaplan, Jim. "Warren Spahn". Society for American Baseball Research . Retrieved 2019-02-23. ↑ "Jim Carlin". Baseball-Reference.com . Retrieved 2019-02-23. ↑ "Jack Brewer". Baseball-Reference.com . Retrieved 2019-02-23.